I was introduced to Carmen Agra Deedy when I had the pleasure of reading her book about the beautiful Martina who is on the look out for an able suitor. What is unusual you ask?......there are so many stories around the theme. Well, Martina is a cockroach and one with a clever Cuban grandma! And you will certainly need to read the story to enjoy the word play and humor Carmen deftly weaves into a folk tale. ST- Martina is a Cuban tale. Why did you choose this one? What liberties did you take with the original? 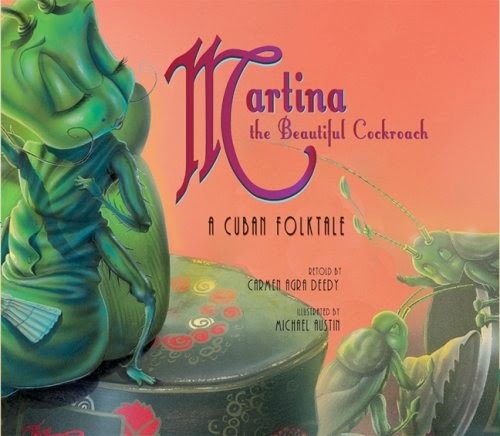 C.D- The story of Martina, the cheeky little cockroach, is one that most Cuban children know by the time they are in school. I learned it from my mother. It is a didactic story and was used to teach children their animal sounds. 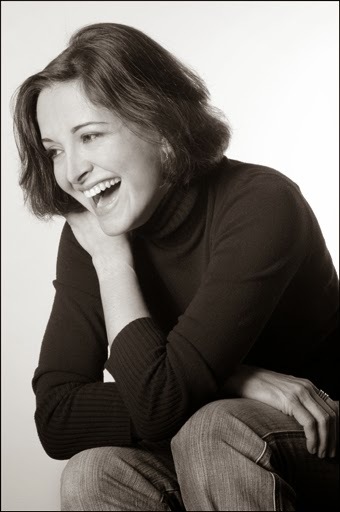 In the original Cuban version, Martina receives many proposals from one unlikely animal after another, and her reply to each one is “How will you speak to me when you are angry?” or, alternately, “All that is well and good now, but how will you speak to me once we are married?” Each fellow answers with the animal sound typical of his species (pigs grunt, roosters crow, horses neigh, cats mew, frogs croak.). Each one is much too loud and inevitably frightens Martina––until she meets the quiet mouse, Perez, whose answer is a very mouse-like titter. The primary change I made in the story, using the “fractured” fairy tale or folk tale form, was to add the Coffee Test. This little twist came from real life. When I was old enough to be courted, young men had to come to our home to visit (I was raised by de facto Edwardians). We were never left alone and my mother always made Cuban coffee while my father, the unfortunate suitor, and I, visited in the living room. Once, when my mother was convinced that a young man I was smitten with was hiding a bad temper, she accidentally (!) spilled coffee on him. He responded rather badly and my mother had the good grace to not say a single “I told you so.” Incredible, right? I was furious with her, but I never forgot. When I was crafting this beloved story of my childhood I had a devilish notion that I would include the Coffee Test . . . only this time it would be a wise grandmother who would offer the suggestion. *Note: While researching variants of the story, I discovered that the tale of the little cockroach did not originate in Spain, as I originally thought (and many sources cited), but in Persia. My primary reference for this was Anne Sinclair Mehdevi’s Persian Folk Tales; she has a story in the collection called “Mistress Cockroach.” Persian? Delightful, I thought! Then I found that she believes its origin is really India! How about THAT? ST- What do you think about the illustration? How did you collaborate with the artist? C.D- I think Michael Austin did an incredible job. Who would have thought cockroaches could be so enchanting? As to collaboration, my input was no more than to suggest peppering the pictures with little household items that would be familiar to Cubans, which might add an air of authenticity. As an interesting side note, Michael’s stepmother is also Cuban, so he had some familiarity with the culture. ST- The word play is very clever (her foot in marriage and the pig being a ham and so on). Was it part of the original? C.D- No. I’m just fond of terrible puns. C.D- The list would be too long for this interview, but I will say that the two children’s authors who remain my go-to favorites are Roald Dahl and E.B. White. When Martina was nominated for the E.B. White Read Aloud Award in 2008 I was mad with excitement! It didn’t win, but it was still an honor. And since you asked about books, here are a handful of favorites: Picture books – Lyle, Lyle, Crocodile, Miss Rumphius, Dr. De Soto, Tikki Tikki Tembo, Old Henry, God Bless the Gargoyles, Olivia, A Visitor for Bear, Ferdinand the Bull, Julius the Baby of the World . . . EVERY one of these is a winner. ST- What next for kids from you? C.D- I have a new picture book with Scholastic Books, The Brave Little Rooster; it’s likely to be a 2015 or 2016 release. The manuscript is finished (okay, it’s never finished until the last nanosecond before it hits the printer) but at the moment they are looking for the right illustrator. I’m very excited about this one. It’s the story of a noisy little rooster who simply will not stop singing––no matter what happens to him. My kind of pesky character. I also have a Young Adult novel in the works with Peachtree Publishers, tentatively titled The Book of Unintended Consequences OR The Boy Who Learned to Read. It is loosely based on the character of my father, who grew up during the Cuban Depression and didn’t learn to read until he was fourteen years old. This one is really coming from a deep well of feeling and remembrance, culture and family; I hope the story turns out to be all (or even a shadow of) what I hope. C. D- My books are all on Amazon, and most are now available through most reading devices (Kindle, Nook, etc.). Although, if you go that route, don’t tell me! I’m a crusty old Luddite and still love the codex (i.e., REAL books). ST- Curious to know about the 'Agra' in your name. Do you know the Indian connect to this? C.D- My uncle, Leo Agra (now deceased), long ago had our family ancestry traced to Spain, and further back, to India. I have never seen the documents and would very much like to know myself! I know I adore bhindi masala, biryani, chole bhature (I’m a chickpea nut), and pani puri (hot, hot, hot! ), so who knows? Thanks Carmen and if you cannot get enough of Carmen Deedy ( like me), go here. We just finished a unit of folk tales, so I put this on my list. The name sounded familiar, but I couldn't place it... The Library Dragon! One of my children's favorites. I will look forward to using Martina next year. Thank you for the lovely interview, Ms Deedy and Art! The books are very steeply priced in India yet - at least the paper and ink books are. I'm still a 'Luddite', as Ms Deedy aptly put, so ebooks are not yet an option. Looking forward to the YA book - The Book of Unintended Consequences - it sounds interesting! I was so happy to hear from the very able Lauren, her manager...and then from the lady herself. I'm Lauren, one of Carmen Deedy's managers. I am so glad you all have enjoyed Carmen's books! 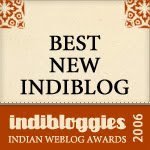 We were not aware that readers in India liked them so much until now. I am so sorry that you all are having difficulties finding affordable copies of Carmen's books. Foreign rights are complicated, and the author does not have much control over where their stories are published. However, next time I speak to Carmen's publishers I will be sure to let them know that they should start considering working with publishing houses in India. With luck, maybe we will be able to get some more affordable copies to you all in the future. Until then, I hope you all continue to enjoy Carmen's stories! Thank you Lauren for writing in. That'd be great, we would love for children here to get access to Carmen's stories! And thank you Ms. Carmen and Art for giving us such a delightful treat to read!